March is meant to be the luckiest month of the year and BOGOF Bingo has some amazing prizes up for grabs this month so it’s the perfect time to see if your luck’s in. This month the prize line up includes a Dell Inspiron Mini Laptop, 4 x £50 HMV and 3 lucky players will receive a £20 Bonus each! If you fancy any of those great prizes you simply need to deposit and spend £15 at BOGOF Bingo during the month of March, easy! Last month ilovemysonlots and kingdlo each won a romantic getaway for two and got their choice of fancy hotels across the country, very swish! There were also 4 x Thornton’s chocolate hampers given away in February so we hope luckey361, dozenredroses, nan2oneboy2girl and kimi10x are all chocolate lovers! Another four players won £25 each too so we’re sure they are very happy with that! Make a date in your diary for 17th March as there’s a whopping 16 hours of free bingo to be played between 8am and 12am in the BOGOF Free Room so get your free bingo fix! This month is also home to a big Bingo Linx Game which will take place on Mother’s Day 14th March at 10.30pm. There’s a huge £14,000 to play for so make sure you make a note of this one! TV Tuesdays offers BOGOFs and the chance to win an HD ready TV between 6pm and 11pm and midweek isn’t boring at BOGOF Bingo because they have Free £150 Cash Wednesdays! Join the fun between 6pm and 11pm to take away some cool cash prizes and beat the midweek boredom. Thirsty Thursdays are named this for a very good reason, when you play bingo between 6pm and Midnight you could win some gorgeous bubbly! 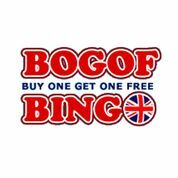 BOGOF Bingo end the working week on a high note with Free Bingo Fridays which offers players 7 hours of free bingo between 11am and Midday and 6pm and Midnight so if you can’t afford a night on the town or a beer or two after work head home and have a few freebie games on BOGOF Bingo instead.